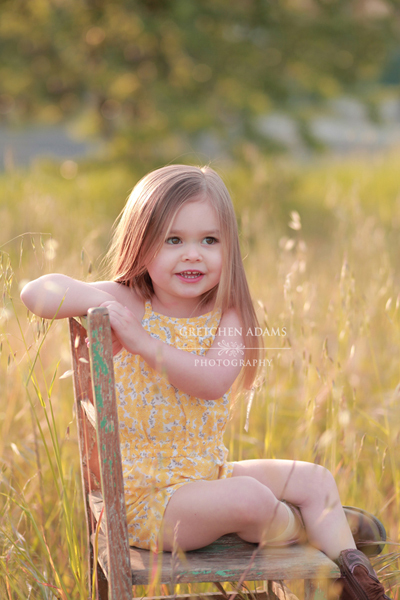 Rarely do I create a blog post about my own children, but believe me, they are photographed A LOT! I always intend to share their images, but somehow taking the time to do so never seems to happen. So since I just shot these of my youngest just today and literally JUST downloaded them onto my computer, I figured I would take a few extra minutes and actually put them on my blog! For those of you that know our family, you already recognize this sweet face as our little dude, Canon. He just turned 7 and is just the best little boy in the world (I'm biased). What might be hard to recognize is that Canon is affected by autism. Which, of course, means we are ALL affected by autism. We are affected because sometimes Canon has strong reactions to certain stimuli and that can cause strangers to stare and pass judgment on his behavior and our reaction to his behavior. But autism has also affected us in a very positive way. We have learned that each of us is wired differently and just because someone doesn't fit into the same box that we do, doesn't mean that there is something "wrong" with them that needs to be corrected. It's our reaction to people who are different from us that needs to be corrected. Canon has taught us to accept people as they come, appreciate the gifts and talents they bring, and to recognize that life would be pretty boring if we were all cut out of the same cloth! And I have to add...Canon is not only a very bright child, but he is absolutely the sweetest little boy on the planet! I overheard him telling his sister yesterday "I hurt my leg, but Mommy kissed it. Her kiss is magical!" Love that kid!! Miss Kelli did very well for her session! As any parent or photographer knows, the two-three age is normally not the easiest to photograph. The trick is to keep it easy, fast, and fun so the kids don’t really feel like they are on display. 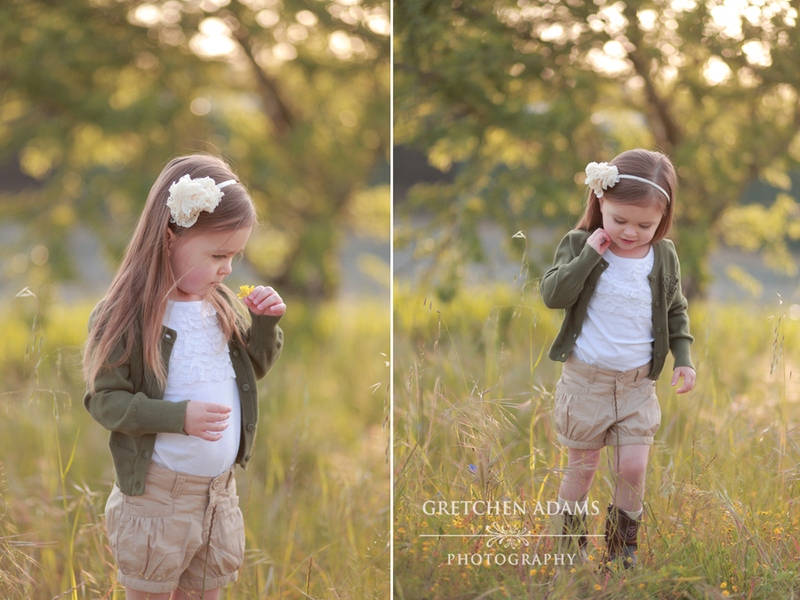 Even though we were able to squeeze in four different outfits, the session only lasted about an hour and all took place across the street from my home so it was very easy (and stress free for her mommy). This was a styled session, so I provided all of the clothing and accessories, with the exception of the cute little cowboy boots which my clients borrowed from a friend of theirs. I planned the outfits in a way that we would be able to just quickly change out a few key pieces as we moved through our locations to match up with the colors in the scenery. 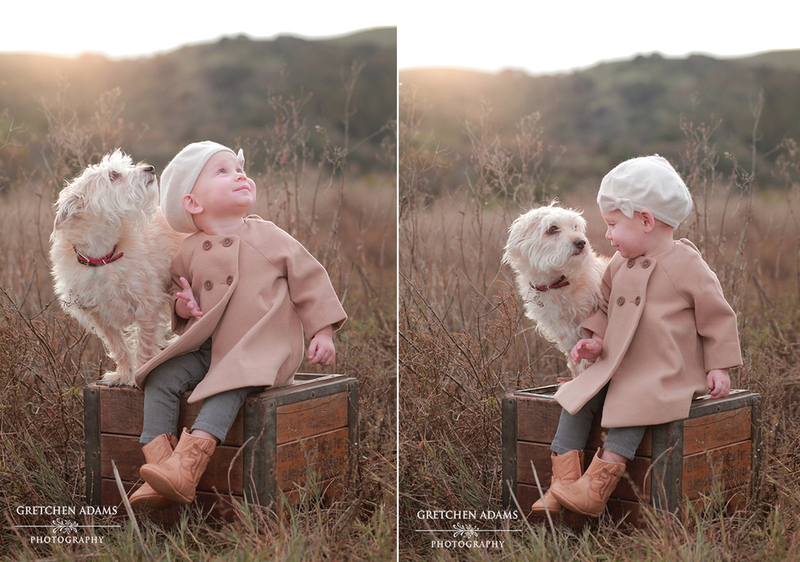 One thing to keep in mind when planning your child’s portrait session, though, is this…the kids run the show. Even though I had four outfits planned for Kelli’s session that certainly didn’t mean that we were guaranteed that she would make it into all of those changes. When working with small children, you have to be flexible. Some kids will do their best if left in just one outfit and others can handle multiple changes, but I never push it and I always watch the kids for signs that they have had enough. The goal is to end on a high note so everyone leaves happy. If this session had also included her parents, I would have tried to keep the outfits limited to no more than two to make sure we weren’t over stimulating Kelli and pushing her out of her comfort zone. Past clients always know that I have my treasure box on hand full of little prizes and that is a wonderful incentive to keep little ones focused on our task. I usually start the session by showing the kids the treasure box and explaining to them that as soon as we are finished, they will be able to pick out a prize to bring home. Then I remind them of the treasure box throughout the session when they start getting antsy and it usually works like a charm to bring their attention right back where we need them. I also keep Pez and stickers in my pockets for extra ammo, but for Kelli’s session we didn’t even need to go there. Her mommy also thought ahead and brought her a couple of new little toys still in the package to help entice her along, and that was a big motivation for her as well! So if you are thinking of having your little one’s portrait created, now is a perfect time as the spring flowers are all in beautiful bloom! 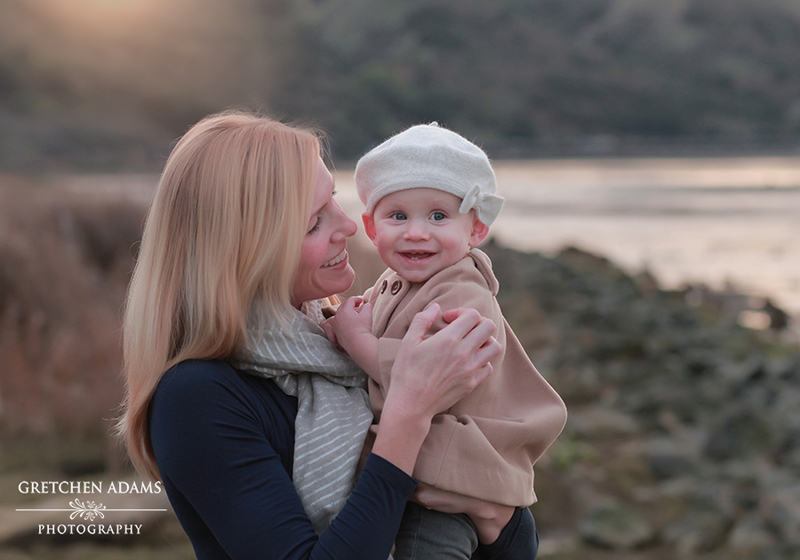 Mother’s Day is right around the corner, and moms and grandmas love beautiful updated portraits of their little loves! I have a lot of dads contacting me this time of year to squeeze in a quick session in time for gifts for their wives and mothers. If this is something you are interested in, please call the studio at 925-676-7036 or send me an email at gretchen@gretchenadams.com and I will be happy to give you all of the info and help you set it up! Don't you want a puppy?? I love beach shoots, especially in the fall. The weather is so nice and mild along the coast and you just could not ask for a better landscape to photograph in than Half Moon Bay. I’m blogging a handful of images from this session to showcase a bit of what a typical beach photo shoot includes…a bit of family poses, a bit of individual poses, some groupings, and a lot of play time. Notice how the clothes go from bone dry to sopping wet? Yeah, that’s pretty typical. We always start off with the posed family shots and individual shots fresh out of the car, while everyone is looking their best and sand/surf free. After that’s in the bag, we head down to the water and grab more family poses, some interaction, and then turn the kiddos loose to play and do their thing. In my opinion, this is when the magic happens. Clean, perfectly posed children’s portraits have their place in holiday cards and gifts for family members. But the fun, sand everywhere, jeans wet, laughing kiddos are the shots that create the memories and make you smile as you walk past them in the home. It just wouldn’t be a beach shoot without it. So here’s just a small sampling to hopefully illustrate my point. Thanks Jason and Hae, for rounding up the kids, pulling together wonderful outfits, and spending the evening playing at the beach with us! Buck and I had a good time and I hope your family did as well!